In their maiden head-to-head tie, SRH had put up a below-par 159/6 batting first with Shikhar Dhawan scoring a 45-ball 63. But their bowlers put up a brilliant effort, including Karn Sharma’s magnificent 4-1-8-0 spell, which left the hosts requiring 28 runs off the last two overs before that equation got reduced to 15 off the last over. 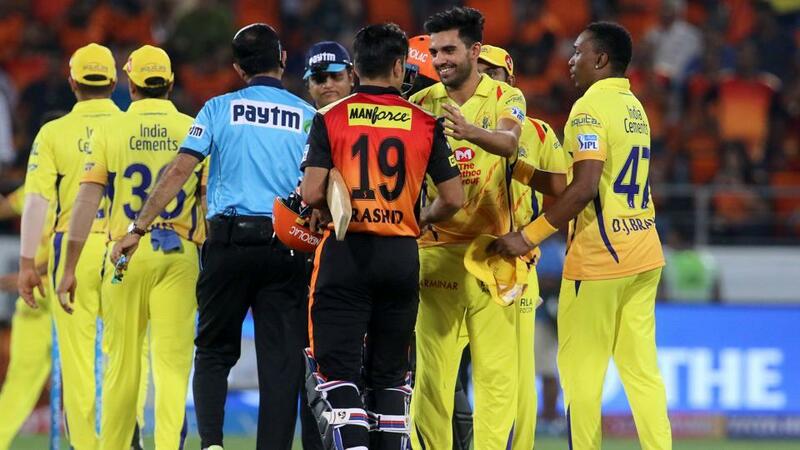 However, CSK reached it with two balls to spare as Dhoni (37-ball 67) slammed a six and two boundaries off three successive deliveries to finish things in style. In the reverse encounter of SRH’s first season, the hosts were raring to go but were outdone in the first innings itself as Mike Hussey and Suresh Raina built a 133-run partnership in 12 overs to guide CSK to a mammoth 223/3. Raina was unbeaten on 99 while Hussey scored a quickfire 42-ball 67. In reply, the hosts kept losing wickets at regular intervals and could only manage 146/8. Half centuries from Dhoni and David Hussey (50) had helped CSK post 185/3. Hussey was the more aggressive of the two as he scored at a strike rate of 151.51 while Dhoni scored 57 off 41 deliveries. In reply, David Warner scored 90 off just 45 deliveries and was assisted by Shikhar Dhawan (49-ball 64) as the duo put on an opening partnership of 116. Dhawan was unbeaten and thus played the anchoring role, albeit at a strike rate of 130.61. The day was almost earmarked for power hitting as Dhoni and Brendon McCullum took the SRH bowling attack to the cleaners as they put up 209/4 at the end of 20 overs. Electing to bat first, CSK were off to a flying start and McCullum was at his aggressive best while reaching the triple-figure mark in just 56 balls. He was well assisted by his captain at the other end who scored a 29-ball 53. Although Warner scored a half-century, with no support at the other end, Hyderabad could only score 164/4. Shikhar Dhawan and Kane Williamson struck magnificent half-centuries as SRH scored 179/4 after batting first but what should have been a modest total was brushed aside as a no-contest as Ambati Rayudu toyed with the opposition bowling attack while scoring a 62-ball 100. Shane Watson complimented him well with a 35-ball 57 at the other end. Rayudu remained unbeaten and helped CSK win.